Retired Police Officer Bill Dory wrote recently about his father-in-law, the history of the man and his murder, and its impact on the family. Mr. Dory has graciously allowed NYCHS to share his essay, written in the third person, with our web site visitors. George Motchan looked like your average man, but inside he was a man with extraordinary qualities. He had a charismatic personality. He was a good friend to whoever he met. If you were lucky enough to meet and speak to him, you would remember him forever, since he left a good impression with people. He treated people very fair. Maybe it was his sincere smile, his stature or his thoughtfulness. Maybe it could have been his wit. Whatever the case may have been, people truly loved this wonderful man and were drawn to him. The Motchans were the first family to move in on their block. George became the welcoming committee for all of his new neighbors as they started moving in. He extended his skills to them whenever they needed him. He was always happy to be of help. He just picked up his tool box and gave them a hand. He was always trying to save them money if he could. Before going shopping, he would always ask anyone if they needed anything. He even let his new neighbors use his washing machine and dryer until theirs was delivered. George would never pass anyone who had car trouble. He even drove the people home, if necessary. The neighbors were always asking him to teach them how to drive. George happened to be a tough instructor and insisted upon excellence. With George, it was the right way or no way at all. Although, George was always helping the neighbors, more importantly George’s family always came first. His children were now grown, and he and his wife, Dolly were preparing for their daughter’s wedding. George was the proudest dad, walking his daughter, Kathy down the isle. He was even more proud two years later when his first granddaughter, Eileen, was born. You would see him walking down the street, his face bursting with pride as he pushed that baby carriage. Next came the graduation of son George from college, and his hopes of getting into medical school. It seemed as though everything was going just right. He and Dolly had just had a wonderful party to celebrate their 25th Wedding Anniversary and went away on a cruise to Bermuda in August of 1975. On September 9, 1975, George went into work the 12 x 8 shift. The night had been a quiet one. George was about to leave work and go home. One of the officers working the 8 x 4 day shift needed to take off, so George being himself, volunteered to work for him. George and his partner, Joseph Connors were escorting a prisoner, Joseph James who was awaiting trail for murder to the Kings County Hospital. What they didn’t know was that James’s girlfriend had planted a gun in a bathroom toilet tank. When James asked to go to the bathroom, George escorted him in. 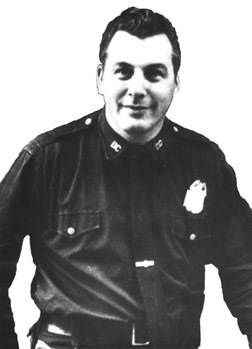 George had no weapon; however, Officer Connors did, which was standard procedure: one officer to be armed and the other with the prisoner unarmed. James came out of the bathroom stall with the gun pointed at George. He told George to call his partner into the bathroom. George called his partner. As officer Connors opened the door George pushed it shut and yelled “Joe, he has a gun”. James then shot George severing his spine, causing him to fall to the floor lifeless. Thinking George was dead, James then fired a shot through the wall striking an innocent female patient. He pulled open the door and shot Officer Connors. James then tried to shoot Connors in the face. God must have been watching because the gun misfired. James then ran out of the Hospital to a car his girlfriend was waiting in. A few days later, George was in the hospital and seemed to be getting stronger, even though he would be paralyzed for life. He told his son-in-law Bill, who was a New York City Police Officer, about what happened. He told Bill he knew James was going to kill him and his partner so, George said, he had to do something. He also told his son-in-law to be careful and that the most important thing is to do what’s right and to go home to your family. Even at a time like this, he was thinking of others. George did what was right but he didn’t get a chance to go home to his family. Six days after his escape, James was recaptured. It was the very same day George Motchan died. George never got to see his son go to medical school. Two years later, Bill and Kathy had another daughter, Kelly. Two years after that, his son graduated medical school, got married and gave George three more granddaughters, Brooke, Jaye, and Tori. Twenty five years have gone by, George’s wife, Dolly, still lives in the same house. On quiet nights, she could still hear him working in the garage or see him coming up the stairs for dinner. But then, she wakes up with a tear in her eye because she realizes, it was only a beautiful dream. This dream is a lot better than the one when she hears the phone ring and gets sad news and rushes to the hospital to find George lying on his back with tubes and hoses hooked up to him. The only relief he or she gets is holding hands. Then she wakes again with tears and heartbroken all over again. George never got to see his four other granddaughters, and they were cheated out of meeting him. All that they have are the pictures and stories that their grandmother and parents have told them. The whole family is proud of the many honors that he has received. They try to understand why this good man was killed and his partner almost killed by this man who has no regard for life, a man who had already committed a murder. James was tried, convicted and first sentenced under a state law mandating the death penalty for killing a officer in the performance of his duty. But his death sentence was set aside after a high court ruling held the mandatory feature of such death penalty laws unconstitutional. The governor at the time would not sign into law bills to remedy the invalidated death penalty law by changing sentencing procedures. This then is the background to James being given a 25-years-to-life sentence. The family put its faith in God and doesn't believe in killing but, if anyone ever deserved to be executed, this heartless man surely did. They do wonder why this man is now eligible to be set free to kill again. When he put the gun to Officer Connors head as Connors was lying on the floor, he proved that he had no regard for life. He just wanted to kill because he could have gotten away easily without killing Connors. Can James now go home to be with his family and if things don’t go right, just kill again? The Motchan Family now lacks a husband, a father, grandfather, and friend. All they have are the memories of a man who wanted to help everyone. They know that he is somewhere helping someone right now. If you look in the dictionary under the word Hero, you should find a picture of George Motchan for he defines the word. God bless you, George. You are missed and will always be remembered.